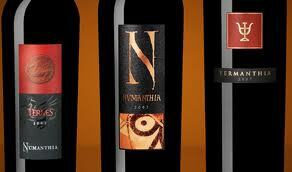 Back on October 5, I tasted the three wines from the Numanthia Winery in Toro (Spain). In ascending order of price and quality, they are Termes, Numanthia, and Termanthia. Last night (11/14/2012), I got to drink these same wines and a couple more with dinner. When I tasted them in my office, we tasted out of excellent tasting glasses (Riedel Vinum Riesling Grand Cru which I use for virtually all of my extensive in-office tasting as well as for my everyday glass at home). Last night at dinner, we were drinking out of Riedel Vinum Bordeaux glasses. In my office, the Numanthia wines followed three amazing Tete de Cuvee Champagnes: Dom Perignon “Oenotheque” 1996, Veuve Clicquot La Grande Dame 1998, and Dom Ruinart Blanc de Blancs 1992. Last night the Numanthia wines followed an aperitif of Krug Grand Cuvee. Here are my notes from October and from last night. In my office: Tech: 14.5% Alcohol. 100% Tinta de Toro (which may or may not be Tempranillo) fermented using pump-overs and aged 14 months in French oak barrels (20% new) and bottled without filtration or fining. The unique vineyards feature un-grafted vines planted in deep sand. 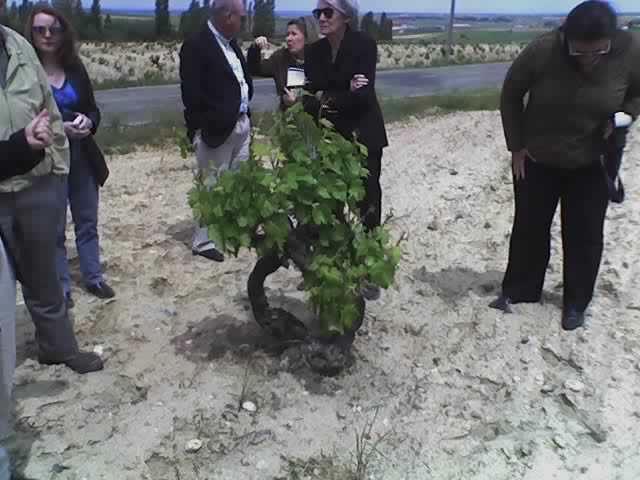 Average vine age is 30 years for Termes. Sensory: Purple in color with well formed legs; dry, medium-bodied with balanced acidity; medium and chewy phenolics. Dark earthy coffee scented Spanish red. Rustic, subtle leather and spice with a hint of cocoa. Somehow both fresh and rustic. MAybe best with simple grilled meats. BS: 90. At Dinner: When compared side by side with three vintages of Numanthia, the Termes comes of as fresher and lighter, more open and quite ready to drink although it benefited from the larger glass and a fair amount of swirling. A rough decanting might have served it well. It stayed fresh for the whole two and a half hours we were at the table. Based on its performance last night, I’d bump the score to 91. In my office: Tech: 14.5% Alcohol. 100% Tinta de Toro from 20 hectares (50 acres) of 70 to 100 year old vines planted in deep sand. Fermented using pump-overs in temperature controlled stainless steel with malo-lactic fermentation in barrels during 18 months in 100% new French oak barrels. Bottled with no filtration or fining. Sensory: Purple in color with well formed legs; dry, full-bodied with freshly balanced acidity. Supple, rich, ripe. Spanish but with a decided new world bent. Rich leather. Supple. YUM. BS: 92. In my office: Tech: 14.5% Alcohol. 100% Tinta de Toro from4.8 hectares (11 acres) of 120-plus-year-old vines. This gets a five day pre-fermentation maceration (aka a “cold soak”) in stainless steel before fermentation in French oak vats, plunged down by feet twice per day during the 10 days of fermentation followed by extended 14 day post fermentation maceration. Malolactic fermentation is in 100% new French oak Bordelaise barrels. Once malolactic fermentation is complete, the wine is transferred (racked) into other 100% new French oak barrels for 24 months of aging. Sensory: Purple in color with well formed legs; dry, full-bodied with freshly balanced acidity and quite chewy phenolics. Super rich and chocolatey but in the best way. More black than red fruit with lots of extraction. Notes of spice and subtle leather. Chewy, and somewhat rustic but with the elegance sand imparts and more. Distinctly Spanish but with echoes from Bordeaux and California. BS: 94+. At Dinner: This massive extracted wine benefitted most from the larger glass but still needed more time to come around. As it was served later (the other four wines had been in the glasses on the table when we sat down), it had the least amount of time to breath and evolve. Nevertheless, it did open up in the glass. This is a monster big wine that reminds me of an Andalusian horse in that it offers both power and elegance. With food and in the bigger glasses with more time to both evaluate and appreciate, my score bumps up to at least 96. With more time, it may have gone higher than that. For me, this may be more of drinking wine than a dinner wine but I still think it would shine with braised beef short ribs or maybe a braised lamb shank. All in all, a great opportunity and a very interesting chance to compare both the wines and the idea of tasting versus drinking. This entry was posted in Uncategorized and tagged BearOnWine, Drinking, Numanthia, Tasting, Termanthia, Termes, Tinta de Toro, Toro. Bookmark the permalink.